Our designer conservatory works with almost any building configuration and can be tailored to meet your design requirements. Explore our conservatories from Ultraframe in Virtual Reality to begin your journey. A designer conservatory manufactured by Ultraframe – and installed by Fox Windows – will provide you with a room that’s a natural continuation of your home in Kenilworth, Warwickshire, Leamington Spa and surrounding areas. This real room feel is achieved through the introduction of key features like an insulated pelmet, which improves thermal performance and comfort. Optional super-insulated columns can be added to make your designer conservatory look thoroughly modern. Take a look inside a designer conservatory now and without getting out of your chair. Visit our new virtual reality page to take a 360° tour and click on hotspots within the image to learn about the many exciting features that will come with your purchase as standard. Further improve the thermal capacity of your designer conservatory with super-insulated columns. Choose this feature to create a truly modern exterior and benefit from thermal efficiency levels five times greater than masonry piers built to the same specification. A U-value of 0.16 is achievable with Ultraframe super-insulated columns. The glass used in each designer conservatory blocks out most solar rays. During summer, your room will remain a pleasant temperature - leaving you to relax or entertain friends and family. When the colder seasons begin, the high-performance glass will help prevent heat loss through the roof and keep you comfortable. You’ll want your designer conservatory to blend in with the architectural style of your home. Fox Windows will talk you through the wide range of colour options available, so that you can choose a colour scheme that’s appropriate. You can also build your conservatory online and get prices within minutes by using our free design tool. Hide your roofline from view and create a stunning exterior by asking Fox Windows to include a decorative cornice as part of your design plan. You can choose a flat version that works with almost all Ultraframe systems, or a curved one that’s right angled and compatible with all their roofs. Contact us for advice and a free quotation today. The designer conservatory we install will function like any other room in your home. Whether you want to use it as a living room, lounge or as part of an open-plan kitchen design, the insulated pelmet that comes as standard will keep you warm. It will also allow you to enhance that feeling of comfort by adding speakers and spotlighting. Your designer conservatory can be built to cope with different building shapes. This means we’ll be able to meet your design requirements in full, without asking you to compromise. We can install a lean-to conservatory if space is limited, or a T-shaped structure that can be split into two seperate rooms. Ask for advice when calling. The Quantal Roof is made from aluminium and features fewer bars. It is incredibly strong and uses concealed technology to support larger installations You can include bi-fold doors in the schema for your designer conservatory that open to greater width, rewarding you with exceptional views that last all year round. Choose the Classic Roof to enjoy the benefits of a system that can be built to accommodate varying size requirements. You won’t need to compromise on width, as this system can also cope with wider spans – just like the Quantal. Whichever roof you choose, you’ll be able to create a designer conservatory that’s uniquely yours. We’ve added a brand new VR tool to our website. It allows our customers to look around our designer conservatory – and any other roof systems in our Ultraframe range. Once you’ve decided which product you like, you can call us or get a free quote by using our design tool. Getting a quote takes just a few minutes. We have been awarded Ultra Installer membership – an assessment scheme that measures whether an installer is competent to fit Ultraframe products. Fox Windows also meets the criteria needed to belong to Which? Trusted Trader. You can talk to us with peace of mind, knowing we have the experience needed to install your designer conservatory perfectly the first time. 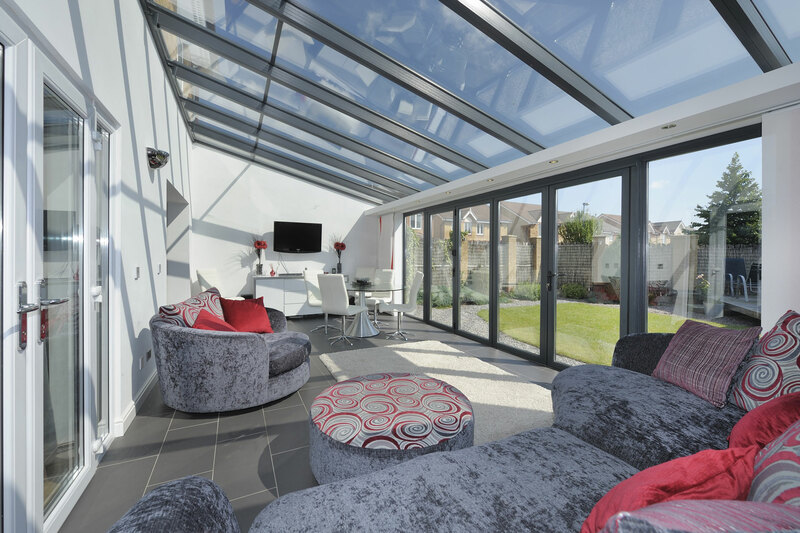 The designer conservatory from Ultraframe can be customised to suit your design aspirations. Explore the possibilities and get a quote today. Ask the Fox Windows team for design advice and ideas for your designer conservatories. We’ll help you build a designer conservatory that looks and performs the way you want it to. We offer our services in Kenilworth, Leamington Spa, Warwickshire and surrounding areas. So, if you are looking for conservatory prices, visit our online quote engine or contact us today.